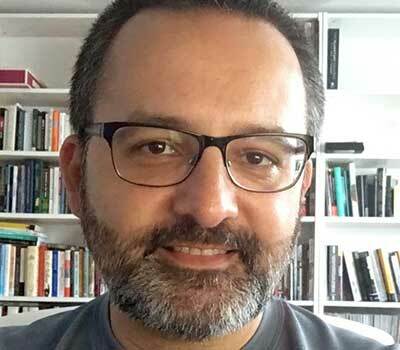 Alberto Cairo, an expert in data visualization, will speak in a REACTOR-sponsored lecture on June 28. Professor, author, and data visualization specialist Alberto Cairo will present a lecture on “Visual Trumpery” in room 2200 Marston Hall on the Iowa State University campus at 5:30 p.m. on Wednesday , June 28, 2017. The non-partisan lecture is sponsored by the Real-time Analytics of Transportation (REACTOR) lab at the Institute for Transportation (InTrans). Like so many other business and academic organizations, the REACTOR lab uses massive amounts of data, in this case, traffic data, to conduct research. But while researchers may be interested in how to analyze terabytes of data, Cairo is interested in how that data is presented to the public. Cairo, the Knight Chair in Visual Journalism at the University of Miami School of Communication, is the author of two popular books on graphics and data visualization. Cairo uses the English word “trumpery,” meaning worthless nonsense, or something that is showy and deceitful at the same time, to discuss how data is presented in misleading charts, graphs, and data maps by people from all over the ideological spectrum. He encourages his audience to develop what he calls “graphicacy,” the visual equivalent of literacy, to counter the trumpery often found in data visualizations. The lecture is free, although registration is required. Cairo is also offering a workshop the next day (June 29) for those interested in learning to create “functional, beautiful, insightful and enlightening” data visualizations. A fee is required for the workshop. Those who are interested can register for either the lecture or the workshop at this website. Scroll to the bottom of the page for lecture registration.